Welcome to Baker’s Treat from Play’N Go! 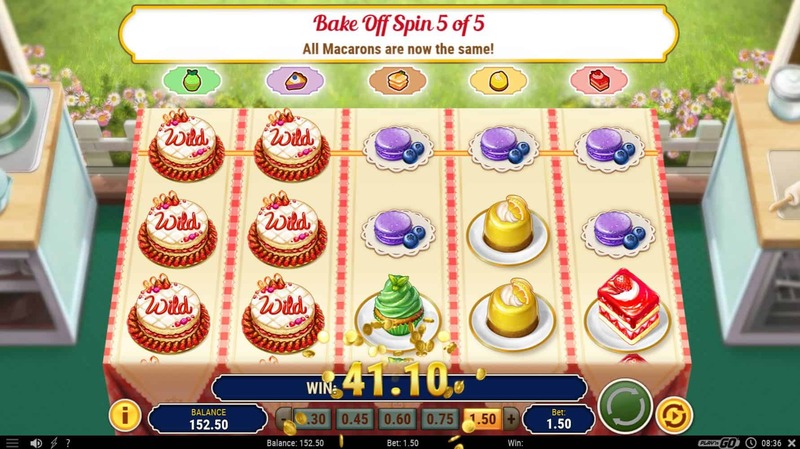 This Five reel video slot has a sweet theme for sure, with symbols like cupcakes, carrot cakes strawberry sponge cakes, lemon cheesecakes and blueberry pies. All of which have some special features tied to them as well! 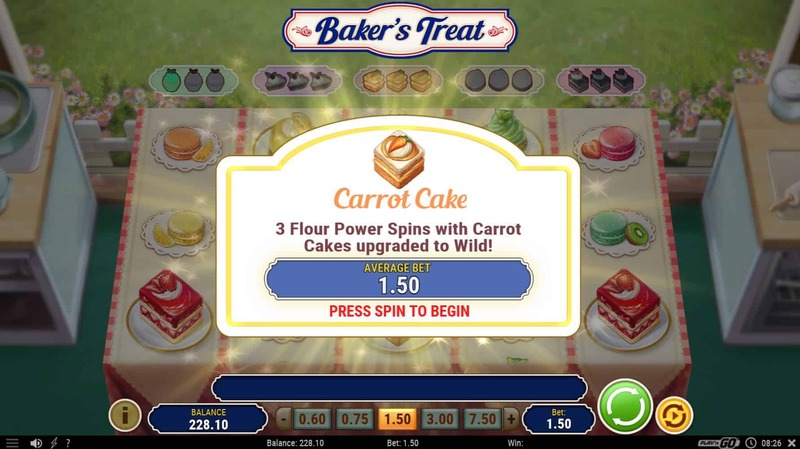 Gather cakes and activate five different types of re-spins. The RTP is set at 96.04%. Prepare for a sugar sweet theme, and the main game packed with small features bumping the balance on a regular basis. The highest possible prize is 5000x which is not too shabby either! In the background, we find a flower garden and a kitchen bench. All symbols are sweet bakery goods, and with all higher paying symbols gathering special features in addition to a Wild Cake symbol. The background music can remind you a bit of the Sims music, which works nicely with the theme. Cakes and baking goods are at the centre of Baker’s Treat, and they come through in the special features. The highest paying symbols also double as bonus symbols during the main game in two different flavours. First of all in the Bake-off feature, and secondly in the Cake Collection feature. The last sweet special feature we find is the wild cake which replaces all other symbols during the main game. Overall, for a medium volatility slot, the special features in Baker’s Treat came often enough to keep us and our balance fairly happy. 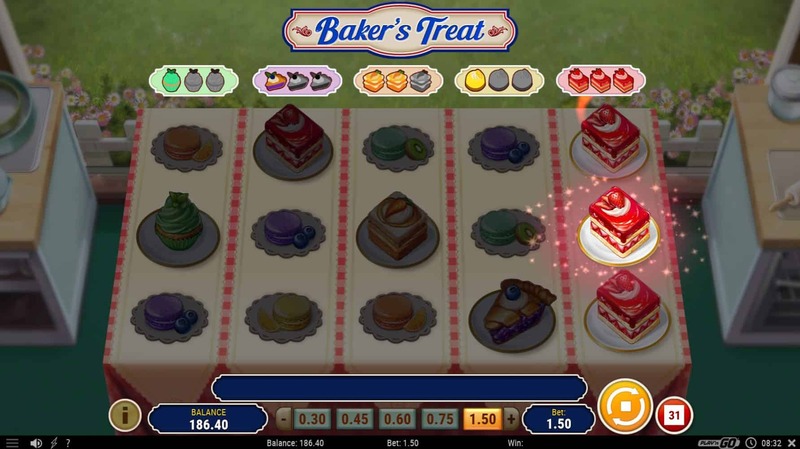 Every time one of the higher paying symbol cupcakes, carrot cakes, strawberry sponge cakes, lemon cheesecakes and blueberry pies appear in a full stack on their respective reels, a cake token will fill up a counter above the reels. Collect three tokens to activate three associated Flour Power Spins. The bet will be an average of the three spins collecting cake tokens. Cupcakes grant two reels are matching each spin. Blueberry Pie grants one wild stacked reel. All Carrot Cake symbols are upgraded to wilds. Lemon cheesecake expands regular wilds to fill the reels. All Macaroons convert to one kind of macaroons. The other cake centred special feature we find in Baker’s Treat is the bake-off feature. All reels have a dedicated cake. If all cakes lands on each their respective reels in one spin, the bake-off feature are triggered. For every stacked cake there’s another extra bake-off spin, totalling to a maximum of 10 spins. One flour power feature is activated per spin and is there until the end of the bake-off feature. A potential of 5000x winnings is possible during the bake-off feature. 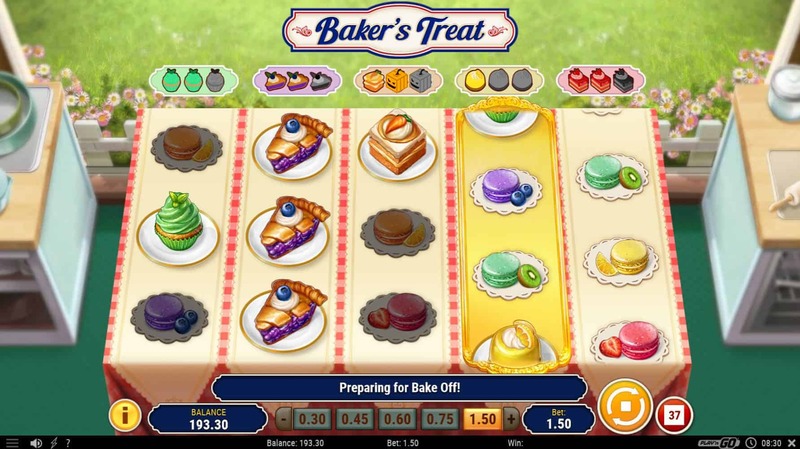 Baker’s Treat was a fun game to play, and we can see how it will be a good game to play for those who prefer a medium to medium/high volatility video slot. The frequency of features during the main game kept us quite entertained; despite not paying out to much, they appeared often enough to keep extending the life of our balance for a while. 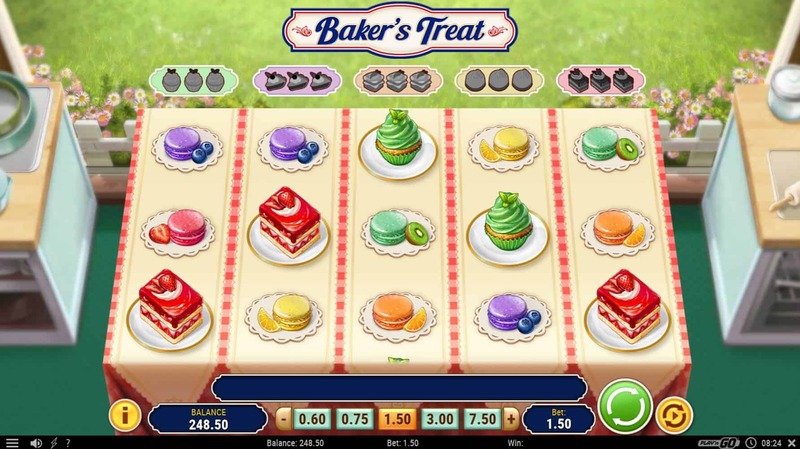 Cakes and bakes is not our cup of tea theme-wise, but this slot shows some great potential!